We've talked about painting your HQ, we covered how you model him... let's look at how you're going to use him. When it comes to tactics, there are as many ways as there are color schemes for Space Marine chapters. I'm sticking to two approaches for this article. You've painted him to look the part, now depending on how you modeled him, you may be better off going one route over another. You can play him up or play him down. Both have their merits and it'll be a combination of game factors that will determine how you come out in the end. Sometimes one will be a better option than the other and there are cases where it's going to take a combination of both approaches to come out on top. You've got the monster HQ model that is near impossible to bring down. He's modeled on a base twice his size that could easily pass for a diorama. And... you want everyone to know you're here. If you've modeled you HQ bigger than life, it's time to show him off. This is the model you put out front. This is the guy that you want your opponent wasting their shots on. He's tough enough to take it and it draws fire away from your other troops. This guy embodies 40k, bullets bounce off him and enemy troops crumble under his feet in combat. Or at least that's what it looks like would happen. Who knows for sure? Maybe the stats for the guy are every bit as tough as the model looks. Maybe he's a sheep in wolf's clothing hoping that you don't catch on. Either way, the effect works. It gets your attention. Vulkan is doing a perfect job in the picture above. Right out in front, modeled much more ornate than anything else in the army and painted up just a well. If there is one thing you look at and worry about... it's that guy right there. Who knows what the bigger problem is... him or the Land Raider right beside him. Wait for it... wait for it. If you went the downplayed route and modeled/painted your HQ to blend in. Timing will be everything. If he's not drawn out or caught onto too early, you'll need nerves of steel to wait it out until the perfect opportunity to make yourself known. The squad above is in the perfect position. They look like every other squad out there, but they have a killer close combat monster in their midst. Well, not really, but the picture gets the point across perfectly. The enemy doesn't notice/think there is a huge threat by the squad. They're doing what they want in terms of moving around, shooting at what they want all the while oblivious to the insanely powerful HQ right under their noses. Time it just right and you can swing the tide of battle in one round. Your Commander comes out of nowhere (right in front of them the whole time) to wreak havoc on the unsuspecting units that thought they were going to have their way with the little squad. I don't know if one way is better than the other. 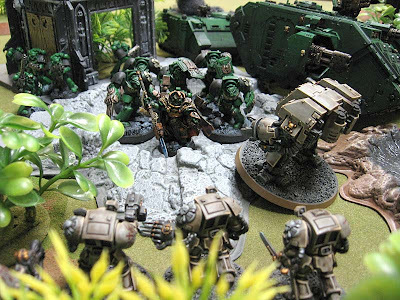 You can use your modeling and painting to reinforce the method you prefer, but it comes down to the individual battle and deciding at that point how you want to play it. Can you take a weak HQ and make him look the part of being "larger than life?" Absolutely. You can make him seem way more powerful than he really is. Can you go the opposite route and take your incredibly powerful HQ and downplay him so he looks like "one of the guys?" Yes again. There's no guarantee that these methods will work, but it may be just the thing to keep your opponent on his toes or maybe catch him off guard. Loved this series. I haven't even been thinking of it like this when I've been planning my HQ models but it turns out that I've unconsciously gone in one particular direction. The Larger than Life direction. I'll link you some pictures when I finally get around to building my Belial. I'm pretty excited about him. Dugatron: Glad you liked it. I've gotten more positive feedback than I thought I would from the series and I'm glad it helped you realise the direction you've gone in. Larger than life is the way I prefer myself. 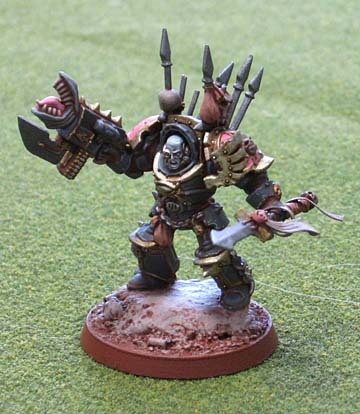 So, what about making this fairly standard marine, daemon, eldar, etc. Larger than Life and downplaying the real one? C'nor (Outermost_Toe): You can do that too. I had a particular squad once that was modeled above and beyond the regular army. Everyone though they were the HQ/command squad when in reality they were just another Elites choice. The actual HQ model was downplayed and blended in with everyone else. The_King_Elessar: Thanks. I'm glad some folks got something from the series. 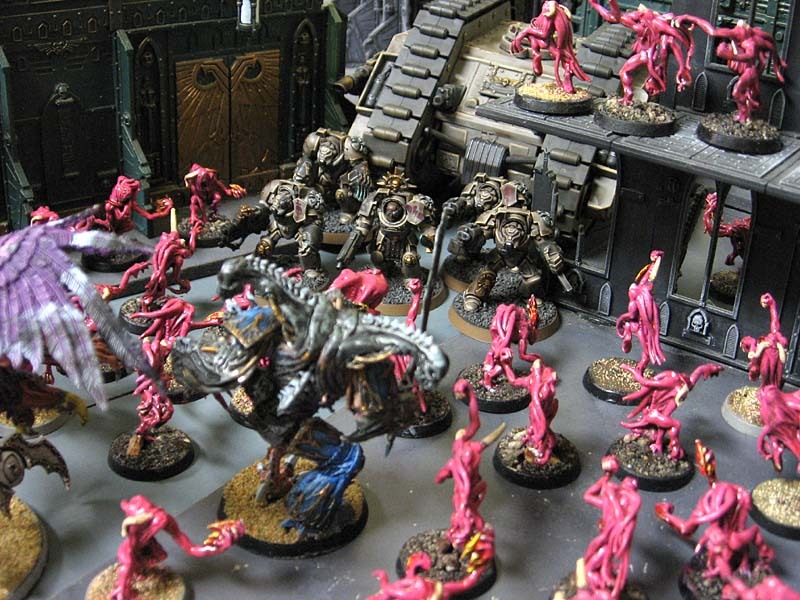 I think when you step back and look at what you're doing and what you want to do with your army... and then make your decisions from there... you come up with an army that better fits you and you're more likely to enjoy playing it.